I went to the Grassy Knoll but found no conspiracy theorists in the immediate vicinity. 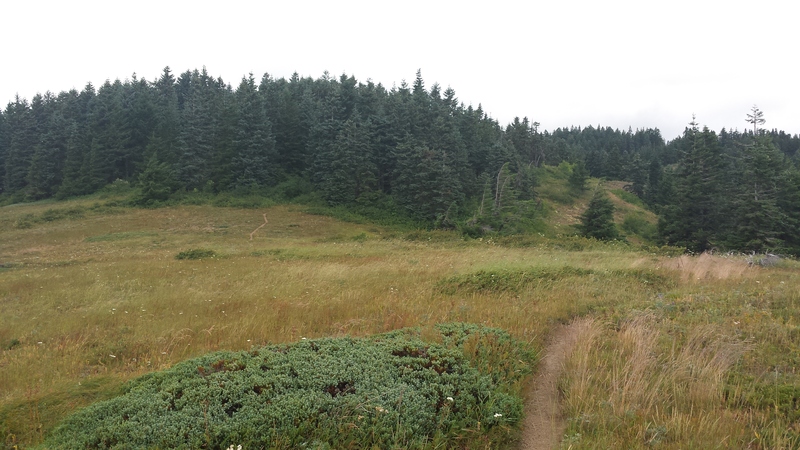 Of course, having to hike more than two miles uphill to this spot in Washington may have winnowed potential wackjobs. 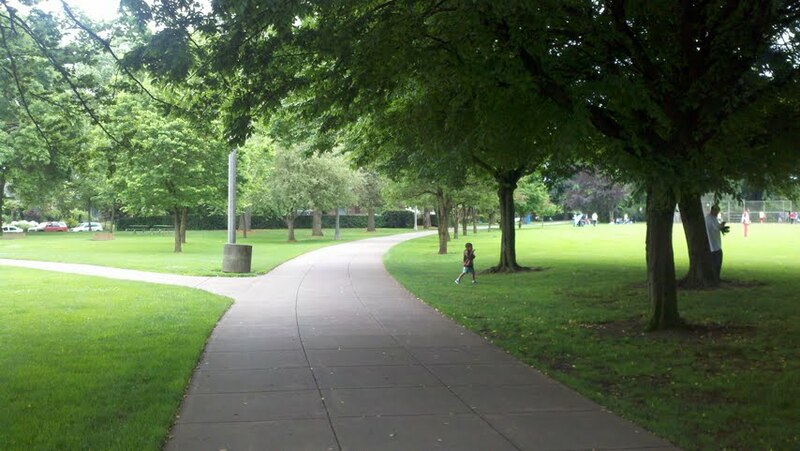 This Grassy Knoll has a fantastic view of the Columbia River Gorge as well as a few major mountains. 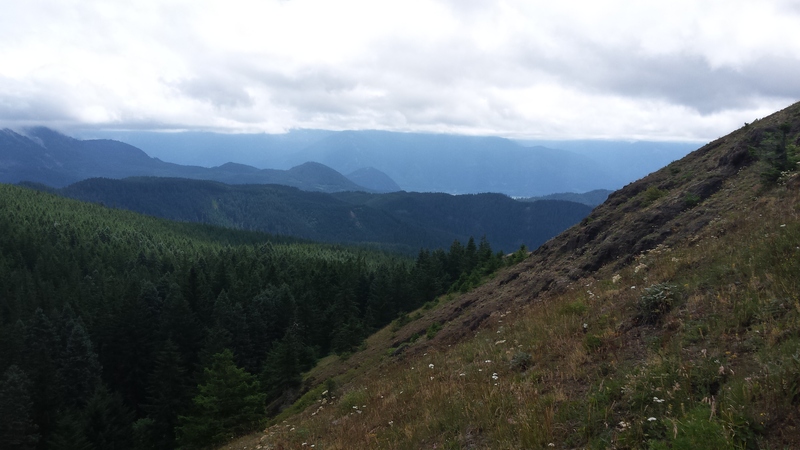 The drive out of Carson is a bit tedious, but the hike is moderate and felt short. There are only a few steep spots. 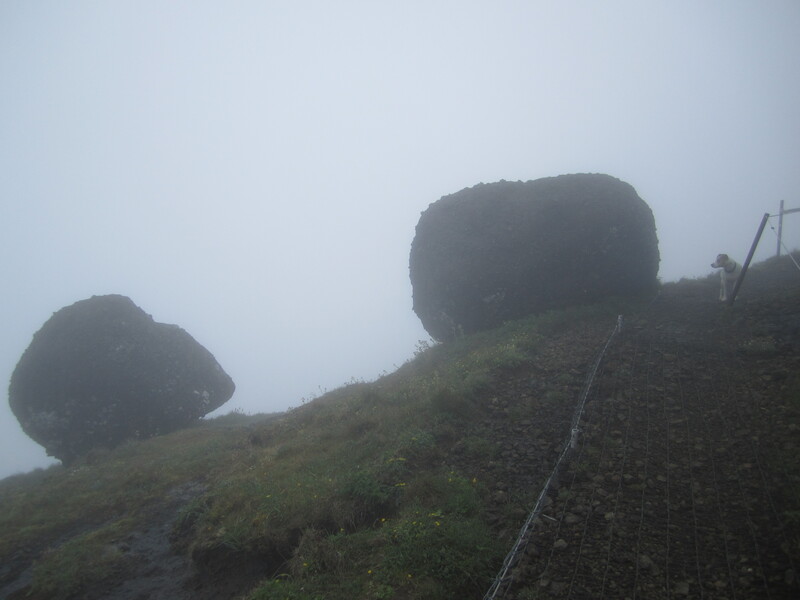 I encountered only three people as I hiked. I met a woman with her German shepherd at the trailhead. 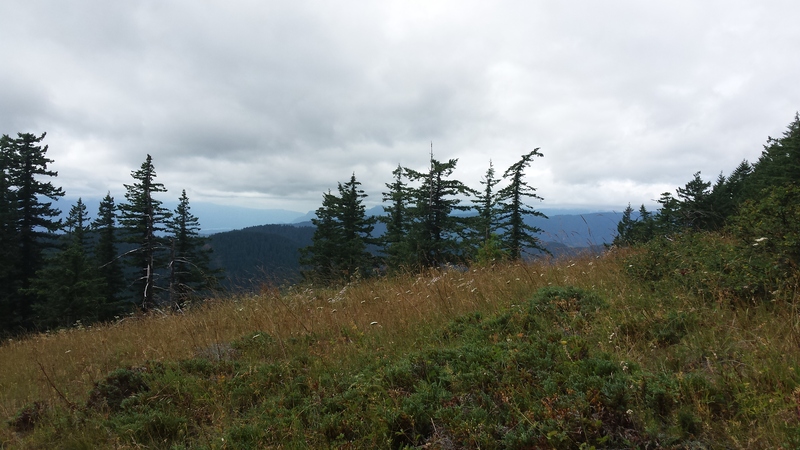 An older couple descended past me in the first mile, close to the first great views, where I looked east toward the base of Mount Adam. The bulk of the massive mountain was cloaked in clouds, but it looked more interesting that way. The remains of an old lookout tower are still very evident when you arrive atop the broad knoll, where the world seems to fall away beneath you. It was a spectacular spot to sit and ruminate on my place in the world. The knoll itself is another mile past the clifftop views. It is a great bald area with views in most directions. Looking down at the sinuous Columbia was terrific in the moody light. 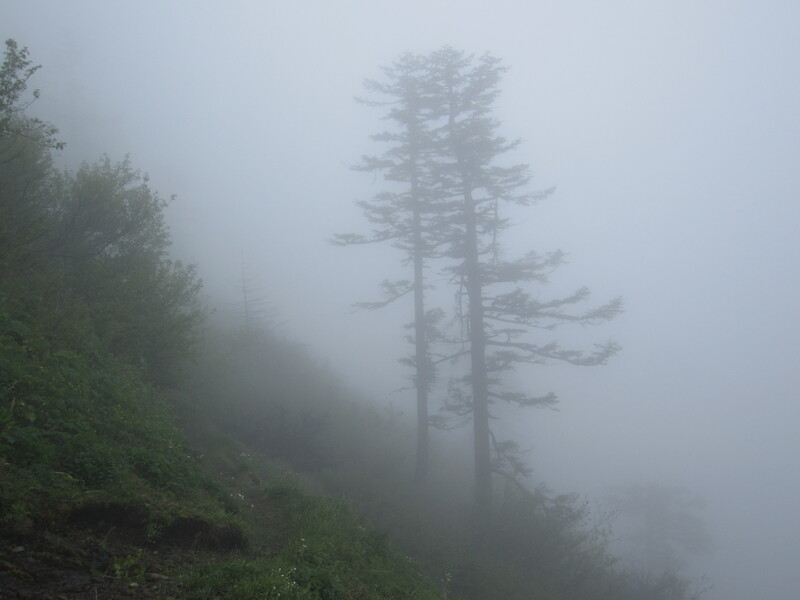 The wind whipped the alpine grasses, suggesting I should not continue lest I get caught in a cloudburst. On a good day with no clouds or wind, perhaps I would go farther, but not that day. On the way down the dirt road, I met a motorcyclist who was touring the country on back roads while on a vacation from his work as a military contractor in Afghanistan. We talked for ten minutes. He was well equipped with a beautiful modern Triumph. A pang of jealousy struck, and then I headed home to my wife, a cold beer, and a very comfortable bed. The forecast online looked good. 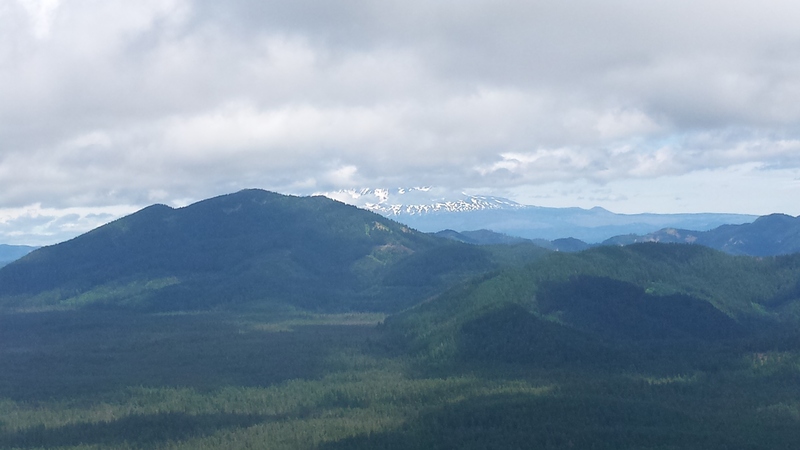 The actual weather was somewhat less positive as I headed from the Portland metro area west into the Coast Range. Clouds began to dominate the sky. 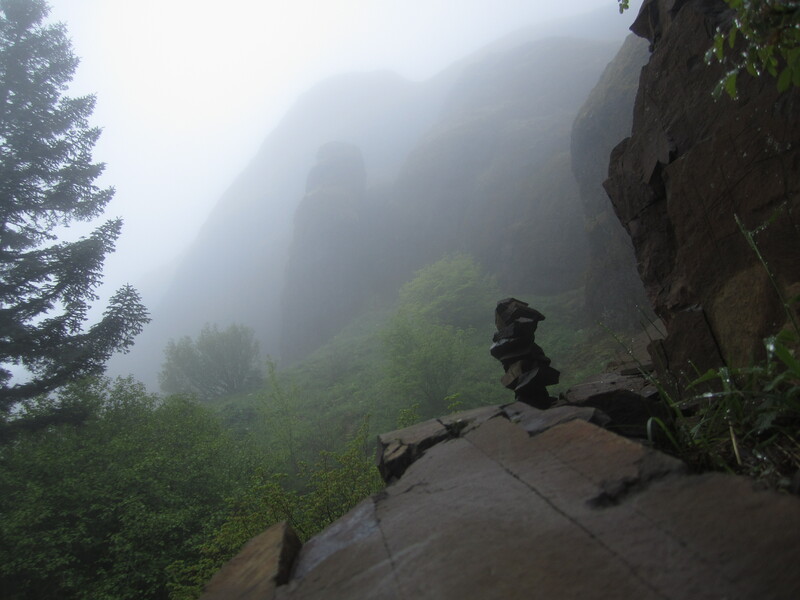 The forest around the Saddle Mountain trailhead was dripping wet, but I had high hopes. Surely this was just a morning fog that would burn off. Or not. 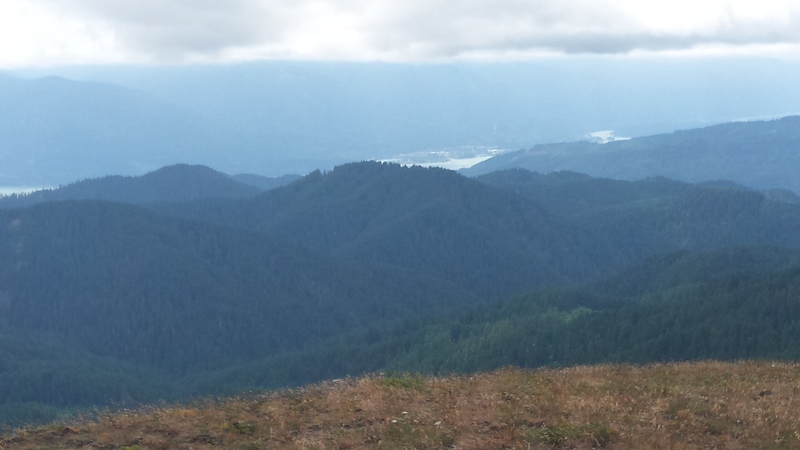 No matter; I would hike regardless, since I’d driven over an hour. http://maps.google.com/maps?daddr=45.90623,-123.745565%20(Saddle%20Mountain%20State%20Natural%20Area)s seven miles off Highway 26 on a road that won’t win any awards for smoothest rides. 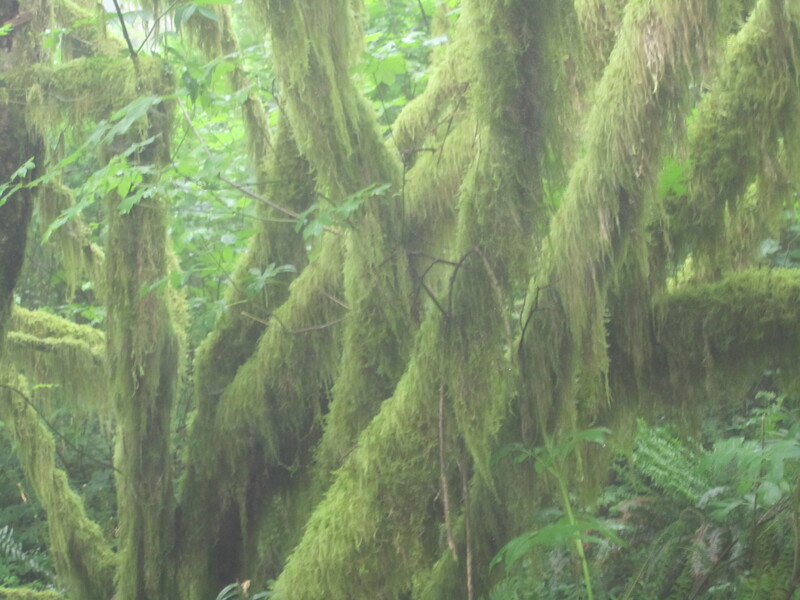 I remembered coming here as a teen a couple times in conjunction with a trip to the nearby Sitka Spruce which some people claimed was the world’s largest. Good times. 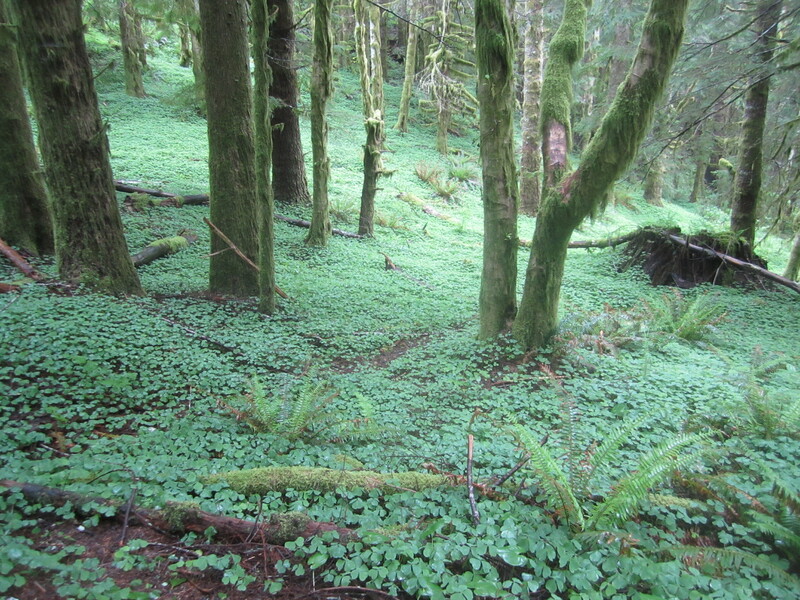 For the first third of the trail, the mixed forest is heavy on the moss, and the beginning is rather steep as it heads toward the Humbug Mountain junction in the first half mile. A smell of smoke hung in the air; as a former firefighter, I debated whether it might have emanated from anywhere besides the campground. Eventually, the smell dissipated. Paranoia again. 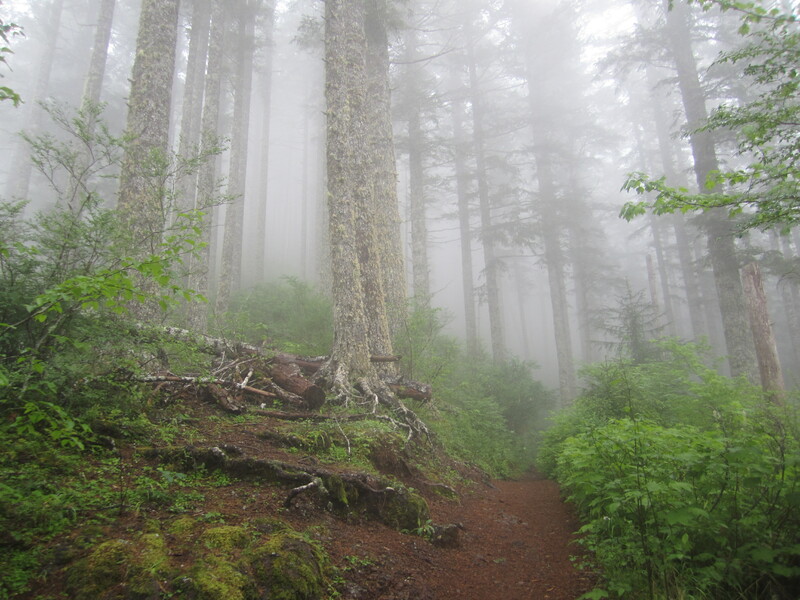 The trail climbed gradually for the most part, the surroundings typical of a western Oregon forest for the most part, until the path started winding around a number of cliffs and sheer, mossy promontories. I passed a few people, and the higher the elevation, the more people were descending. I was surprised to see that, as it wasn’t even eleven a.m. Some people obviously camped at the park, and others must have come from the beach towns at Cannon Beach or Seaside, significantly closer than Portland. 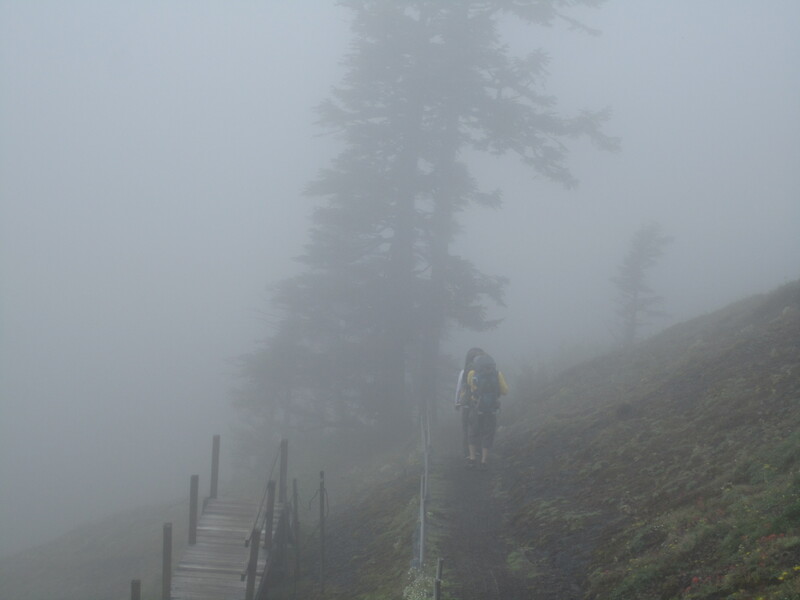 The ubiquitous fog was like a bad haircut. There was nothing you could do about it right now, but it would be okay in time. 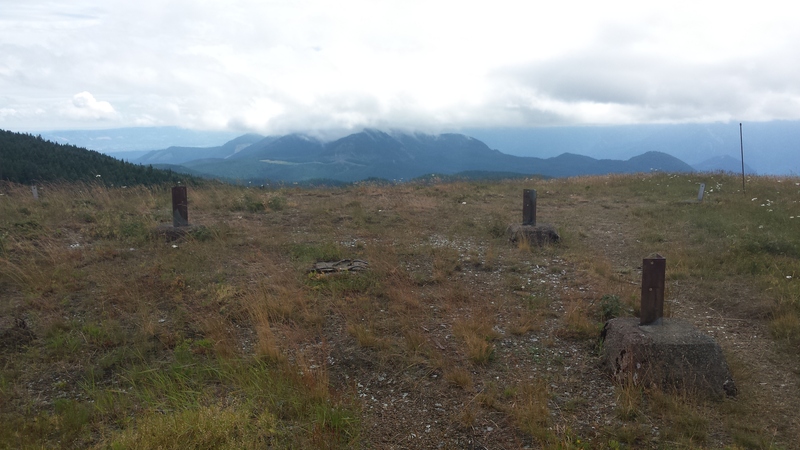 I got to various points where spur trails had been stomped out over time, so I knew there must be terrific views. All I could see, however, was foghorn worthy. 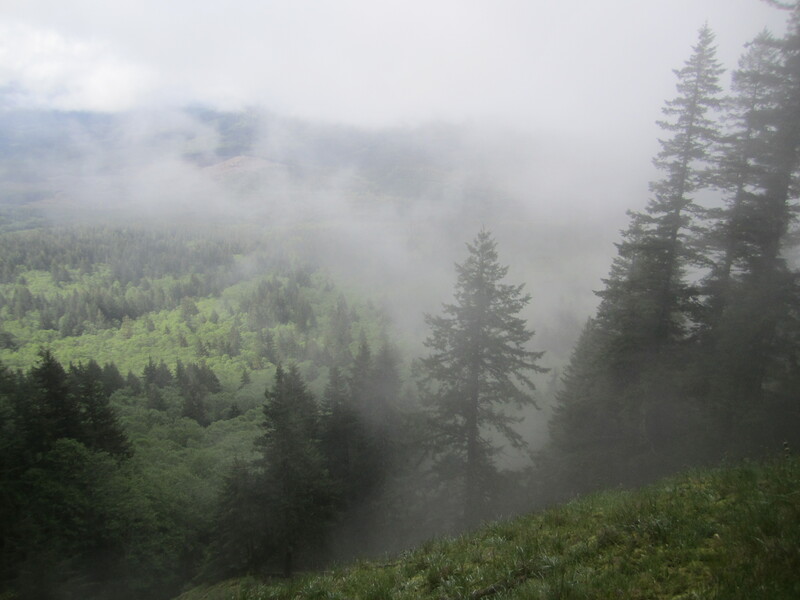 On paper, Saddle Mountain appears to be the most aesthetic peak in the Oregon Coast Range, but I missed most of the highlights thanks to the fog straight out of a forties noir film. 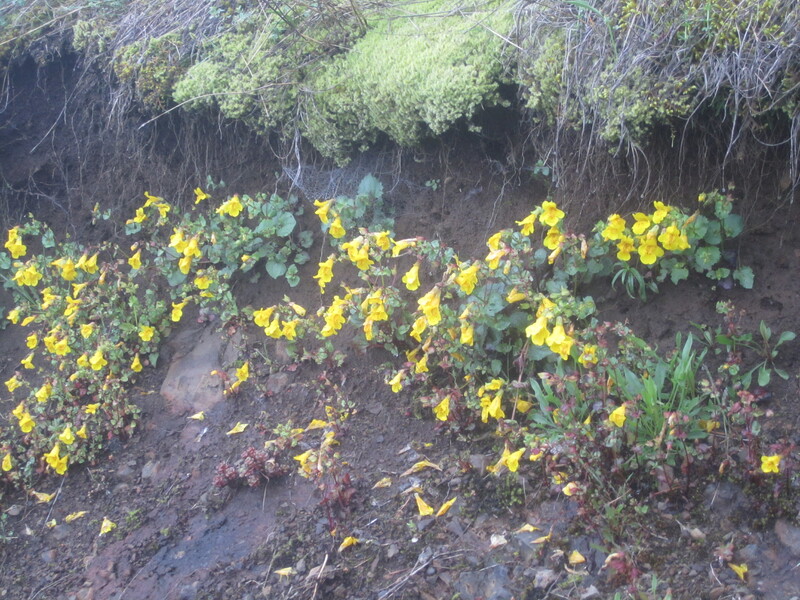 Still, the geology, the wild flowers, and the popularity of the trail made the ascent interesting, along with the ridiculous chain link mesh wrapped around small rocks underfoot, apparently to prevent erosion. 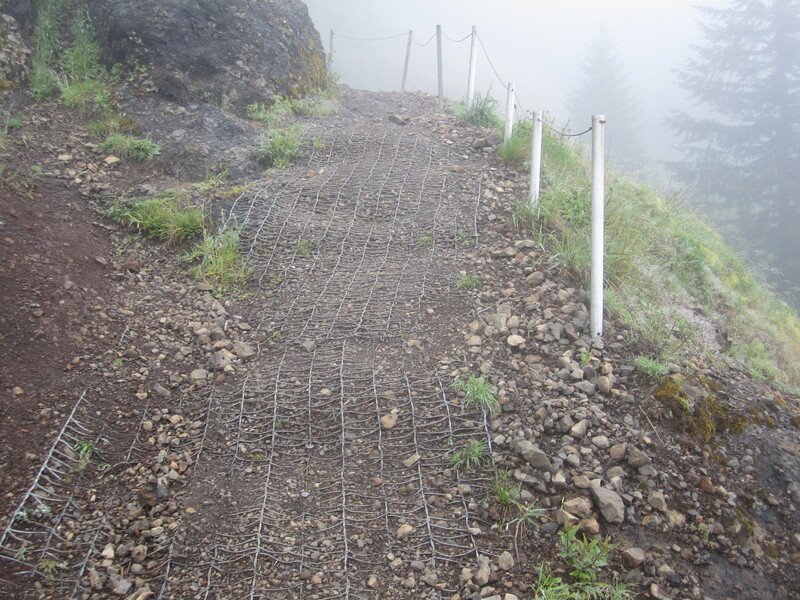 Trail erosion can obviously be an issue, yet so is hiker safety, and this mesh alternated between slick at one moment, and dangerously catchy, so a foot could twist unexpectedly . I slipped twice and almost twisted my ankle once. 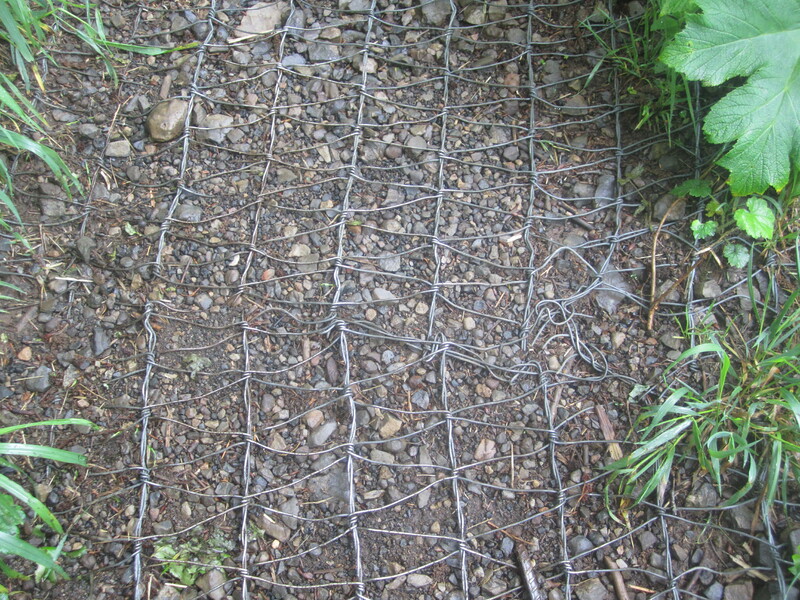 Not a fan of the mesh, Oregon State Parks. 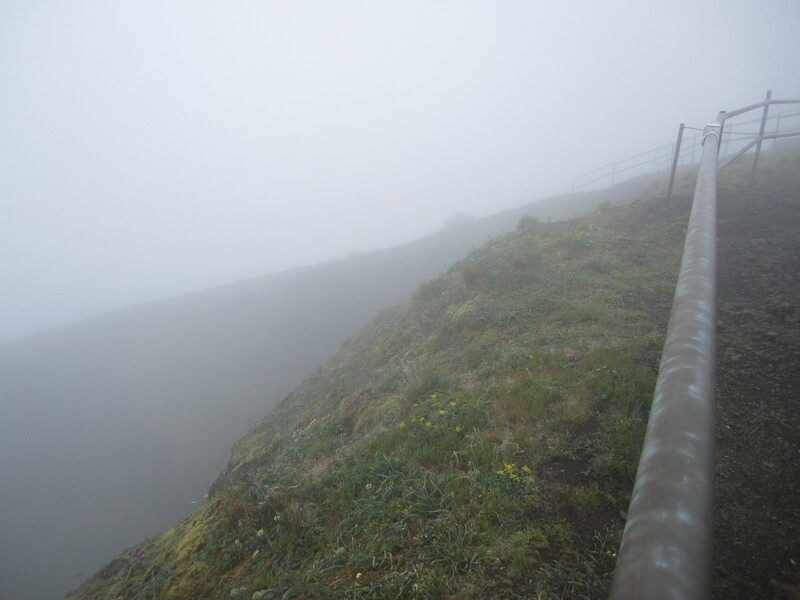 Railings and cables were frequent, which detracted a bit from the setting, but safety is an issue with the steep open terrain. 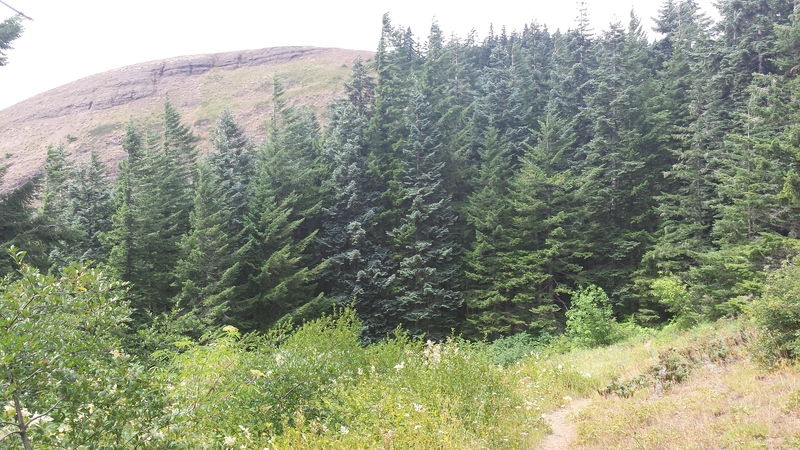 At least one person has died on Saddle Mountain. 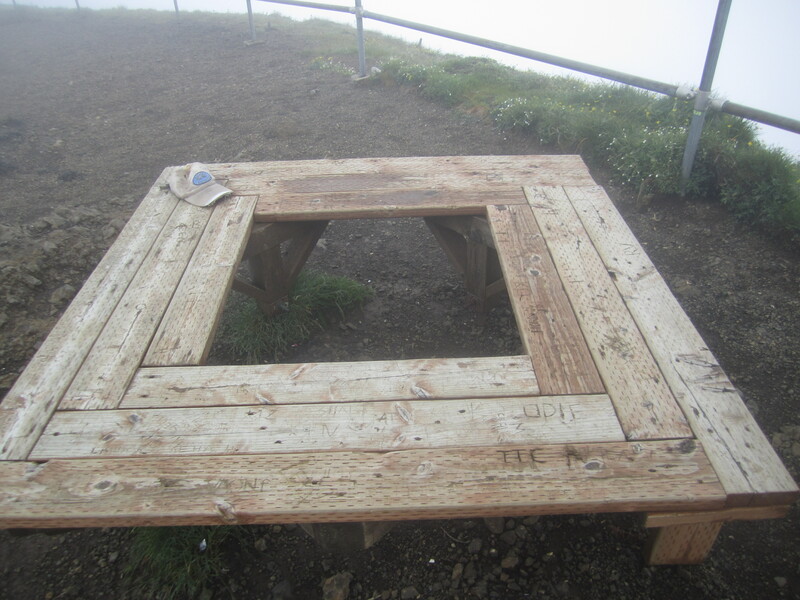 The summit was anticlimactic, since the views I knew must be spectacular were obscured by a grayish-white wet blanket, our dear friend, the fog. 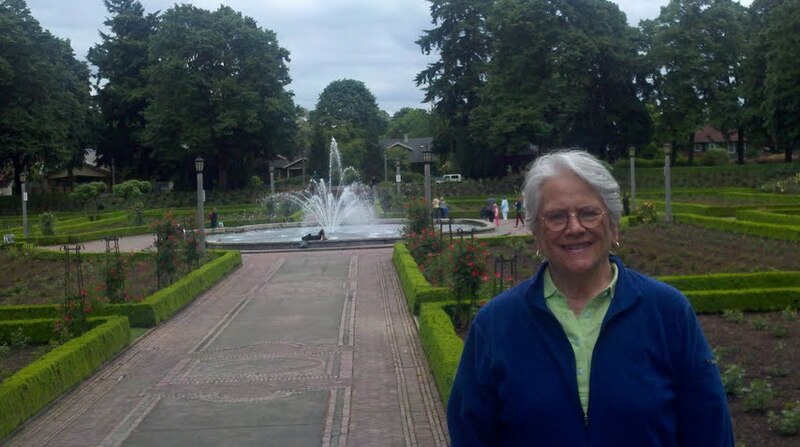 I sat there on square bench with Jackie for a bit, contemplating life. Life is good. 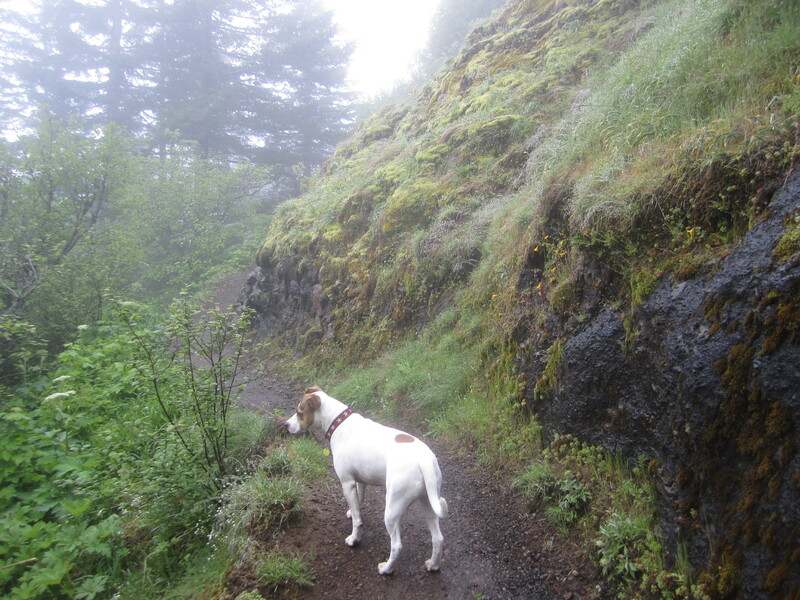 Jackie barked when another hiker reached the peak in five minutes. That was when I saw the pup shivering, and I realized I was fairly chilly myself. 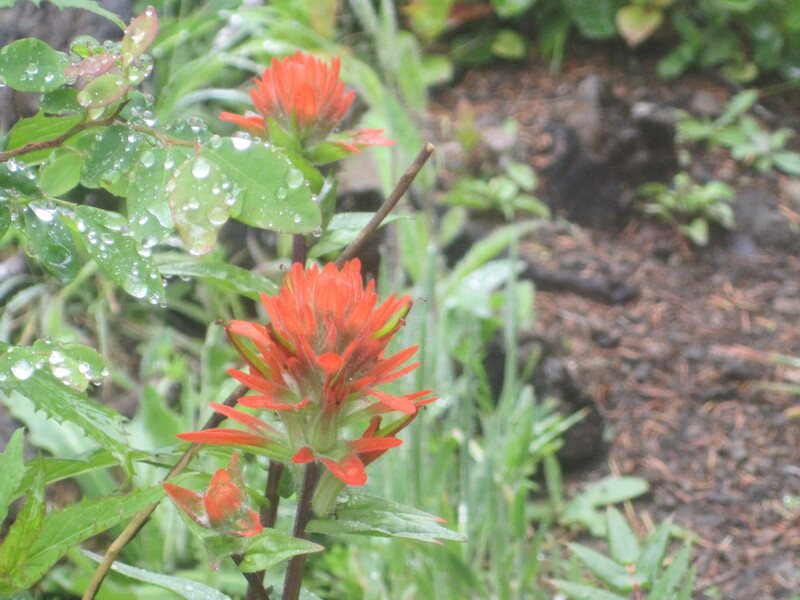 Besides, a bit of actual mist was now falling , so I donned my lightweight rain jacket, and that did the trick. Another couple arrived on top. Time to go. Many people were heading up as we descended. We had to pull over a lot to let other hikers pass. It’s funny how some people are very appreciative of this sort of gesture, thanking me and commenting on how cute my dog is; others won’t even look at me. I don’t always like to leash Jackie, but it was necessary for much of the descent, until we were below the slick rock mesh debacle. 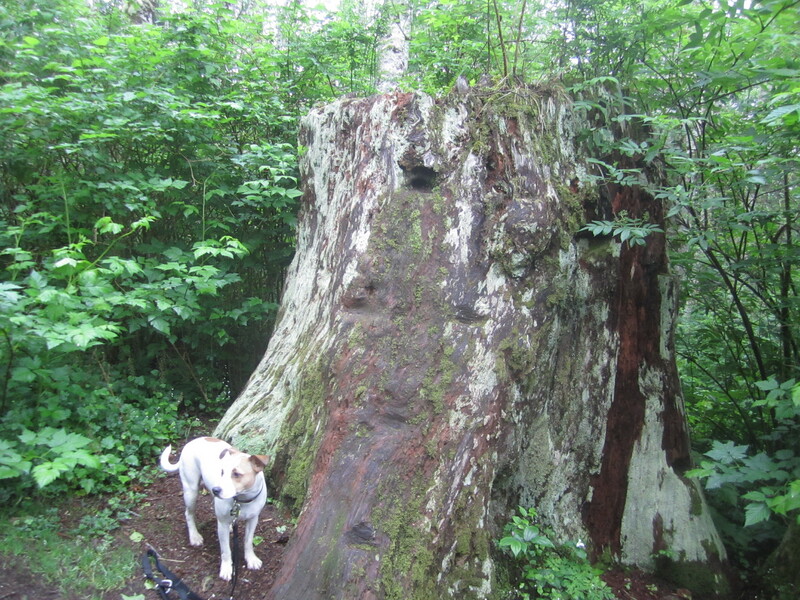 Below that, we could motor, and near the end, we noticed a giant stump right next to the trail; it’s too bad we don’t see many trees of that size in the 21st century.